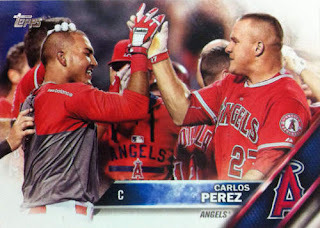 The Major League team is mostly down with the exception of Mike Trout and the farm system is barren - perhaps there aren't a handful of 'future Angels' to latch onto before they reach the Major Leagues. 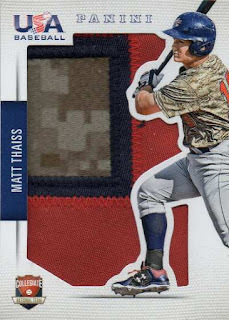 After the Angels drafted Matt Thaiss 16th overall in this year's amateur draft, I searched for some early cards of him and it looked like he had some USA baseball cards - I picked up what I assumed to be a patch card sight unseen and while I didn't know what I was getting, in-hand, this card looks pretty sweet with the noticeable patch piece and also the camo jersey material. 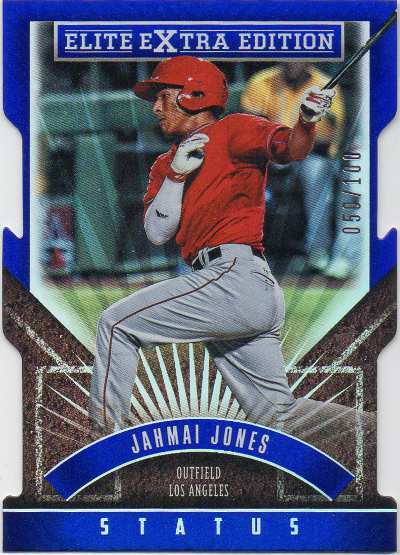 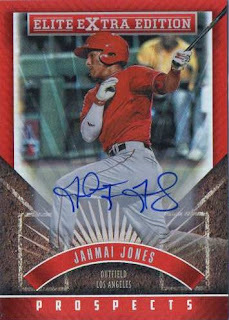 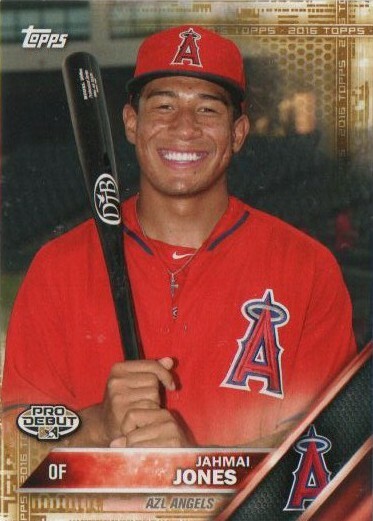 Jahmai Jones is an 18-year old outfielder who was the Angels' second round pick in 2015 - he was drafted out of high school, so while an 'athlete' perhaps, it may take him time to gradually climb through the minors as opposed to a guy who ends up on the fast track. 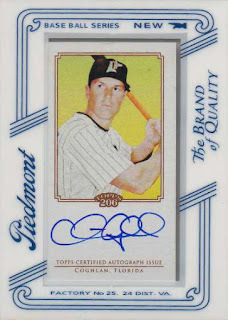 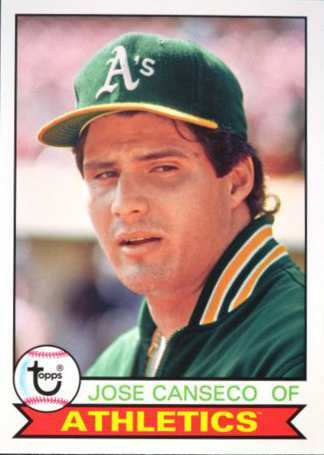 I probably didn't need another certified autograph card of the longtime MLB slugger [I picked one up several years ago] - but the autograph is bold and clean on the baseball material used, so I picked it up for ownage sake. 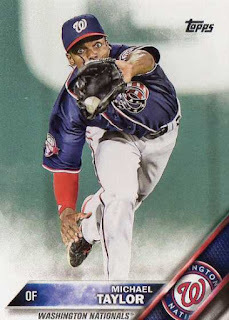 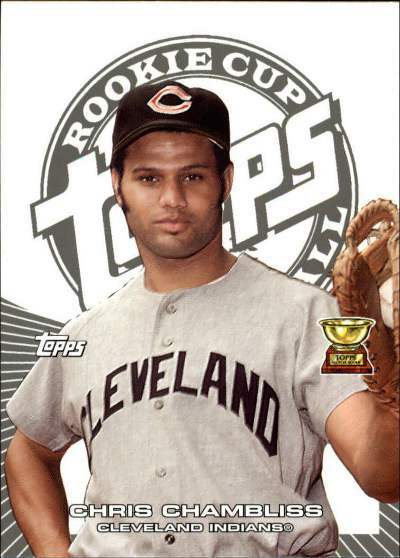 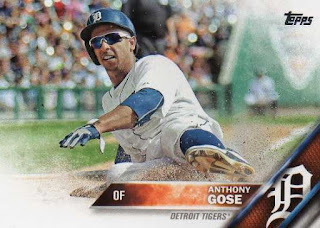 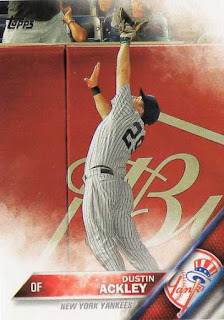 Hopefully the baseball material for these 2015 Panini National Treasures inserts will be durable so the autograph will not fade over the time - the most infamous examples of these types of 'sweet spot' cards going bad come from 2007 Upper Deck Sweet Spot products [kind of like this example or this one], where cheap baseball material [not leather] was used. 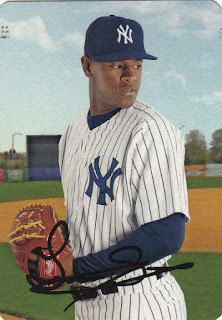 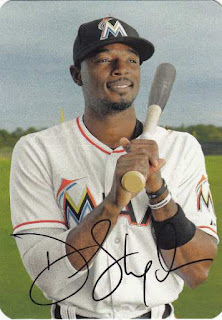 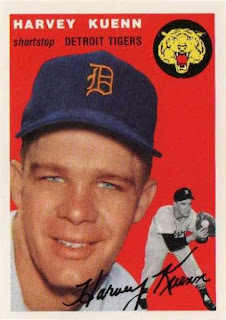 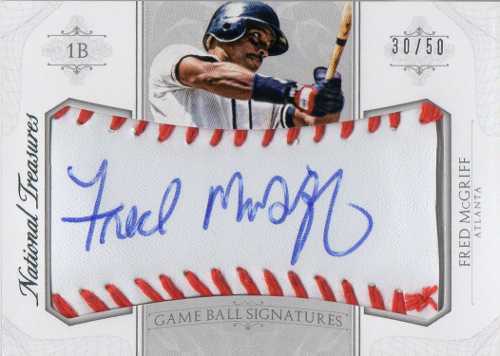 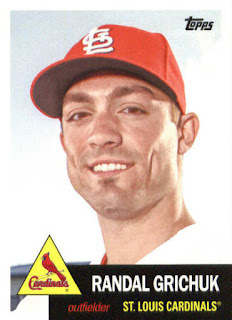 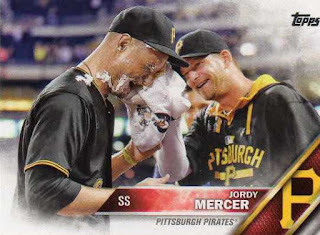 I like these certified autograph cards where presumably a baseball is ripped up and the sweet spot [the area between the seams, the preferred spot for single signed baseballs] - is put together to mimic a signed baseball on a trading card. Pacific Trading Cards may have been the first card company to incorporate a swatch of a baseball into a card - but Upper Deck was the first company to popularize this type of autograph with their Sweet Spot product in 2001. 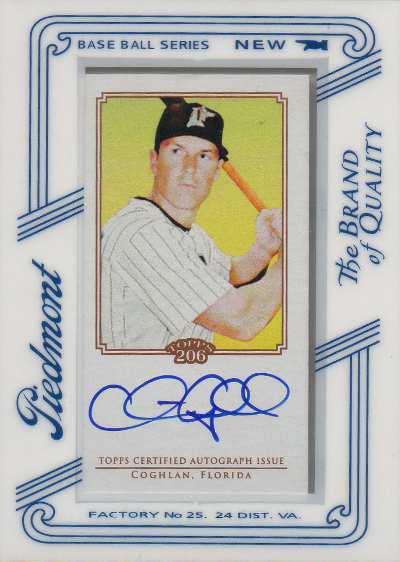 I picked this 2001 Upper Deck Sweet Spot Signatures card of one the most fearsome big league hitters to play in 1990s - when looking at completed auctions on eBay, maybe it's a little weird to see that Belle's autographs don't really go for much. Maybe it's hard to call Belle a typical baseball 'fan favorite' when he seemed like a mean, angry SOB as a player - but he put up numbers, hit home runs a long way and didn't take any nonsense from anyone who dared challenge him. 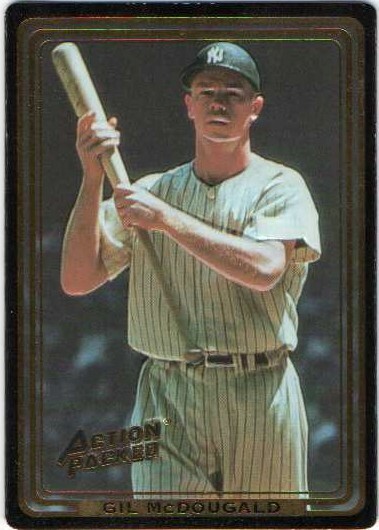 Belle was robbed of the 1995 American League MVP because he didn't want to deal with the media at the time - though a hip injury cut his career short in his 30s, he might have garnered stronger Hall of Fame support if he had been a little friendlier to the press. I picked up a junk auto of the current Chicago Cubs outfielder to add to my award winners collection - the autograph is fairly clean and I like the cutesy design of these framed tobacco sized cards. 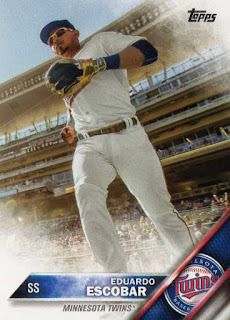 Coghlan was the 2009 National League Rookie of the Year and while his numbers have generally been an up-and-down - he has played parts of 8 MLB seasons and seems relatively viable as a semi-regular type for a contender. 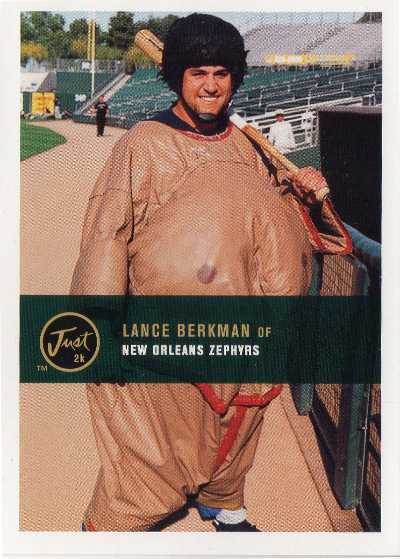 This is the hilarious if un-PC card of Berkman wearing a sumo costume - I'm vaguely aware of this card, I've seen it featured on other card blogs I read and I figured to pick up a copy for myself. 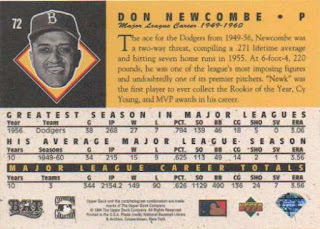 The upper left corner is a little warped though I guess this is just one of those cards that has been sitting around for the last 16 years - until it was decided some guy randomly wanted it out of the blue and it became my card. 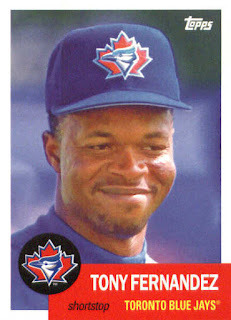 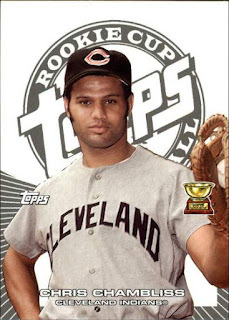 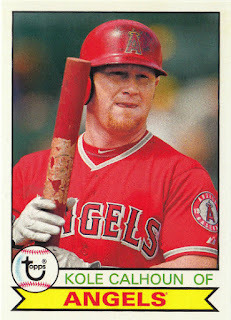 As I fill holes in my award winners collection, I try to make 'era appropriate' card finds - this doesn't mean always looking for original player-era cards, but any cards picturing players with the teams they've won an award with as well as finding cards that sort of focus on the award winning season. 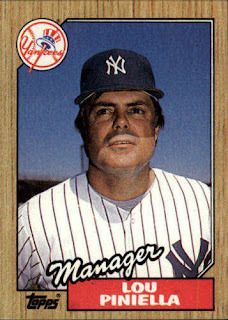 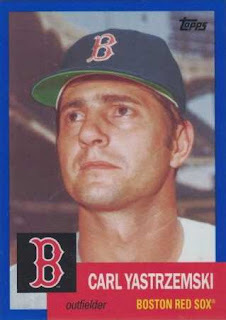 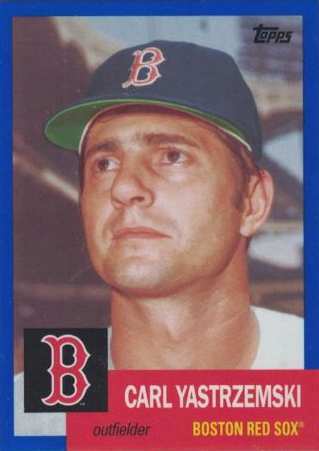 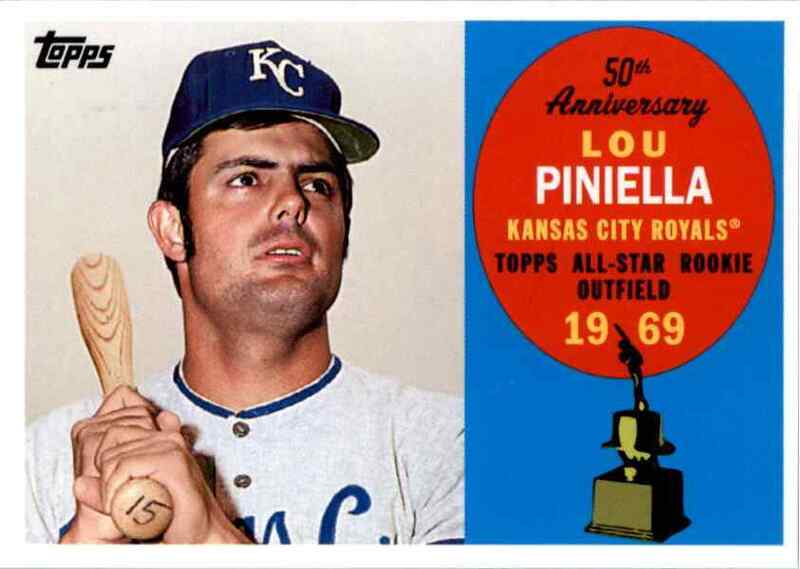 I'm trying to weed out cards in my award winners collection that seem mismatched, even if the card pictures the player - it seems odd to use a manager card for Piniella to represent an award he won as a player and for Chambliss, using a late career card that doesn't picture him with the team he won an award with. 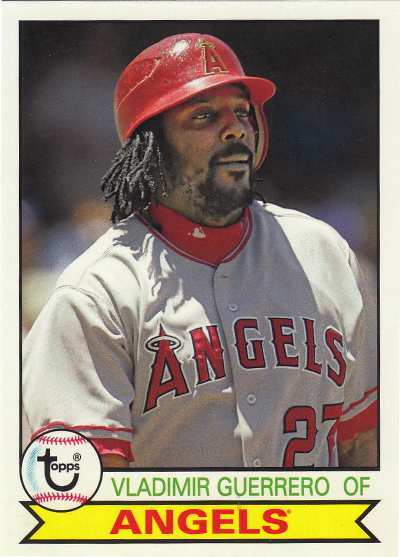 I had to dig this signed card up when I saw Huff was pitching for the Angels - with an 11.81 ERA in two starts [including 4 home runs allowed in 5.1 innings] however, it would surprise no one to see the journeyman lefty disappear off the Angels roster for good. 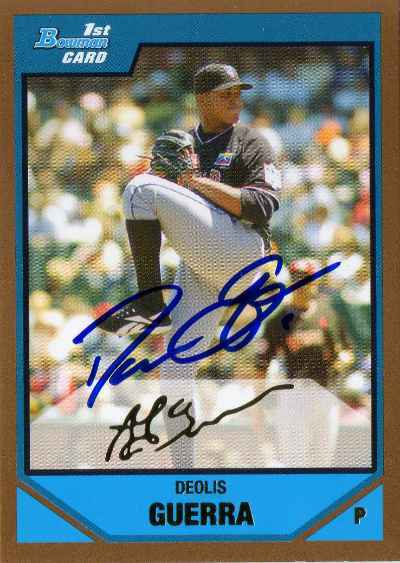 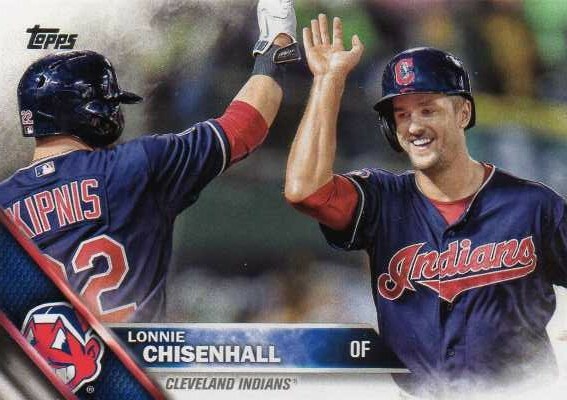 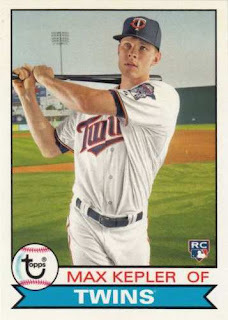 I probably sent a TTM request out to Huff 9-10 years ago when he still had some upside to his pro career as the 39th overall pick by the Cleveland Indians in 2006 - he has pitched in parts of 8 seasons at the big league level, with his biggest run of success [3-1 W-L, 1.85 ERA] coming with the New York Yankees in 2014. 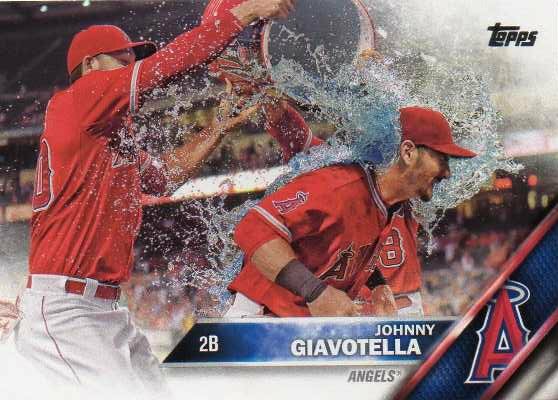 The below average Angels bullpen is needs all the help they can get, even if it means using a no-name guy like Guerra - he was once part of a package of prospects traded from the New York Mets to the Minnesota Twins for one-time ace Johan Santana. Though he fell short of his promise as a prospect, Guerra finally reached the big leagues as a 26-year old rookie last year with the Pittsburgh Pirates - he ended up with the Angels after being selected in the Rule 5 draft. 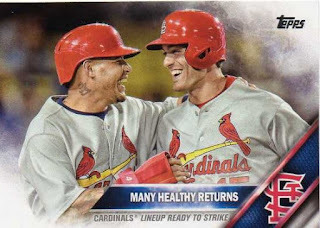 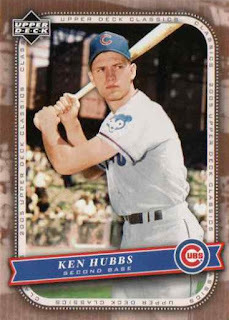 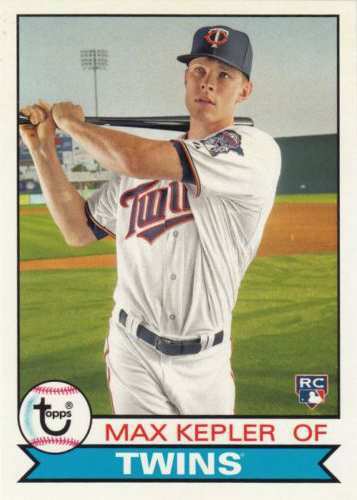 I busted a blaster box of this year's Topps Archives and my thoughts [from a 2015 Topps Archives pack break] about the card stock sticks - I do realize these cards just have to be inspired by and do not have to be exactly like the original Topps cards from 1953, 1979 and 1991. 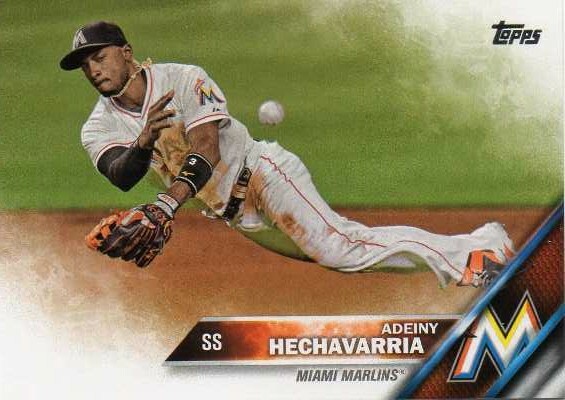 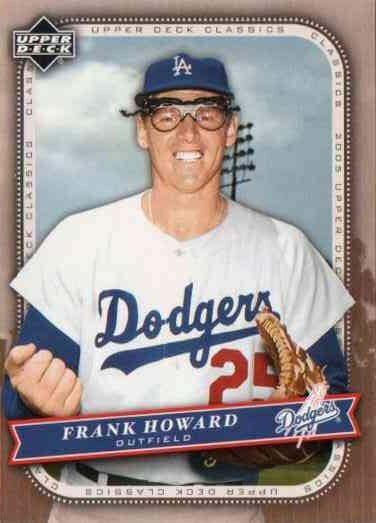 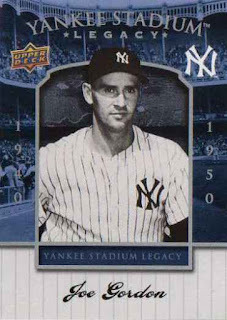 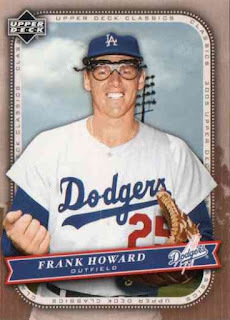 Maybe the cards from Topps Archives is what the finished product would look like - if the people putting together the original cards [whether in 1953, 1979 or even in 1991] would have been able to use current day photo editing software, print on cleaner card stock and in the case of 1953, print in the standard trading card size. 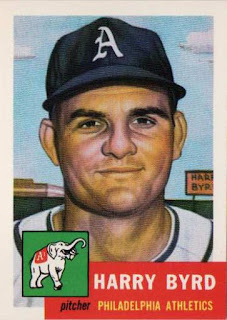 1953 Topps design - I see these as more of an extension of the 2002 Topps Heritage set, rather than the original 1953 Topps cards; maybe my favorite design because of the vintage Topps aesthetics, particularly for the guys that are playing right now. 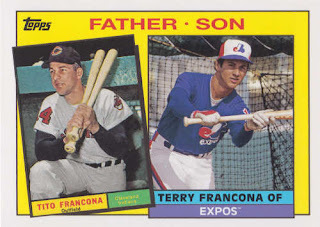 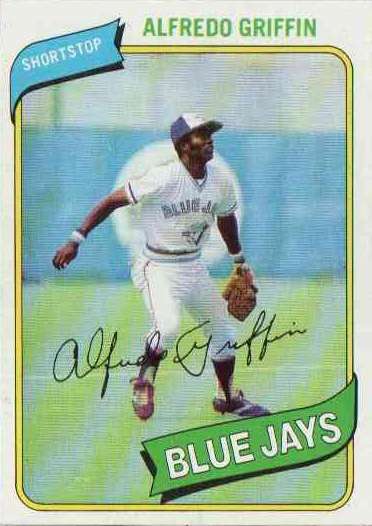 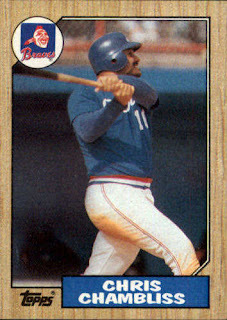 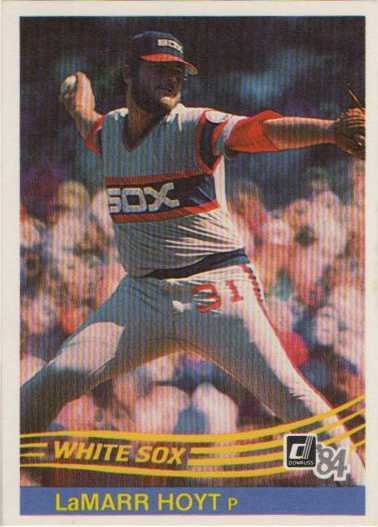 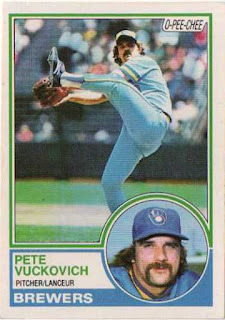 1979 Topps design - I have an idea of the look and feel of late 1970s Topps cards and while 'old-school cool,' the original cards were a little grimy with the backs a little too drab. 1991 Topps design - I've collected my share of 1991 Topps and while I don't expect these cards to exactly mimic the originals, these remind me more of the cards from various mid 2000s Topps Fan Favorite products, than the junk wax era [some jazzy images, but low definition quality] originals. 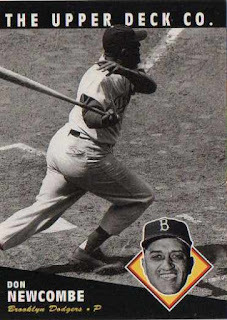 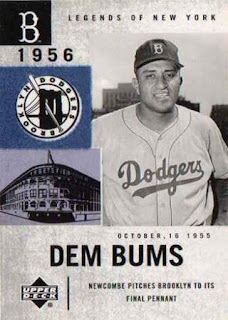 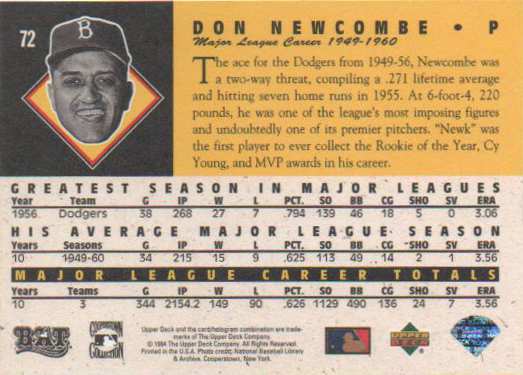 I like this card because it is a 'pitchers hitting' card - with the back talking a little about Newcombe's exploits as a hitter. 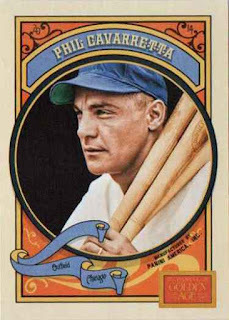 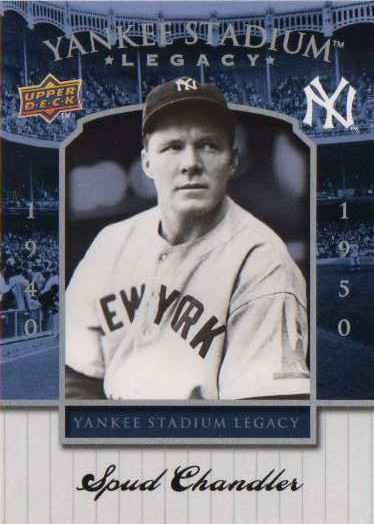 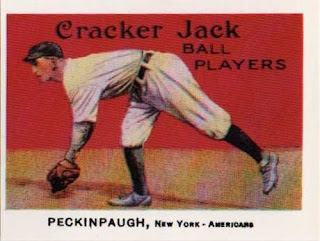 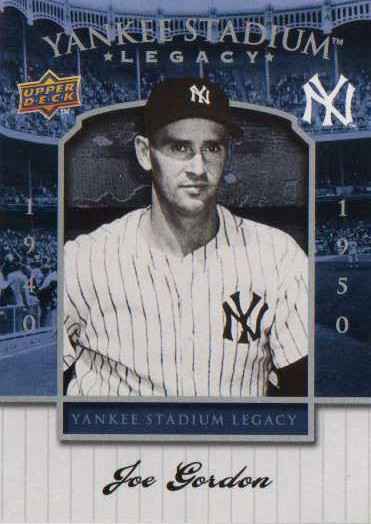 1983 Galasso 1915 Cracker Jack Reprint Roger Peckinpaugh #91 - 1925 American League MVP; I'm not going to worry about it, but I didn't realize this identifies Peckinpaugh as member of the New York Yankees when he won the MVP with the Washington Senators. 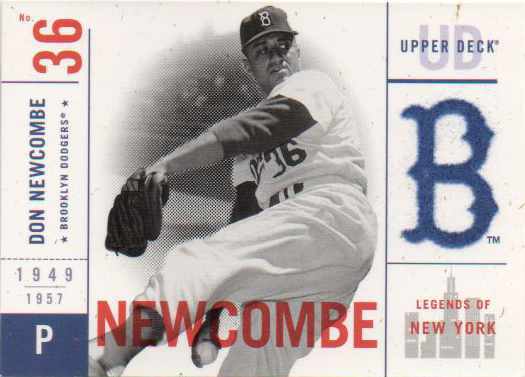 2001 UD Legends of NY Don Newcombe #20 - 1956 National League MVP; a die-cut piece of felt surrounds the team logo, making these cards feel a little different. 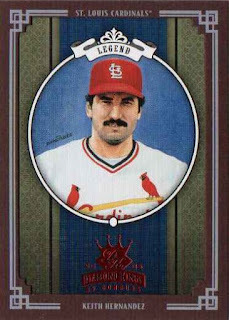 2005 Diamond Kings Red Frame Keith Hernandez #300 - 1979 National League co-MVP with Willie Stargell; I picked up a two-sided, dual jersey [like these] featuring Hernandez and Stargell, though I wanted at least one random card featuring each guy. The card cost about $0.50, but it's pretty nice to have in-hand - red frame makes the cards feel a little more sturdy and fancy.